If you or anyone you know shops at Amazon, we would appreciate if you would use our Council's Amazon Link. By clicking here to go to Amazon instead of going through Google or any other link, we will earn a commission for every purchase made. The only difference in your Amazon experience - the only difference - is how you got there. Over 175 million people shop at Amazon every month! So it is very important that we share this link with all of our family and friends and take advantage of this terrific opportunity to support our Council in this very simple and easy way. With everyone's participation this could mean a lot of money for our Council, so do not hesitate - please forward this email to everyone you know and ask them to please forward this email to everyone they know. Imagine, whether they live in California or New York, Florida or Texas, every purchase they make through our link will help support the important work we do. So the next time you want to shop at Amazon please, click the link below or the one on our Home Page and see for yourself! Same great march - different time of year. Because there is no time like NOW to come together as the Body of Christ to get informed, energized and stand shoulder to shoulder witnessing to the sanctity of all human life from conception until natural death. Jill Stanek, Joe Scheidler, State Senator Dan McConchie, Pastor Calvin Lindstrom, State Representative Tom Morrison and MORE! Free buttons and bracelets to take and share the message of Life. Family-Friendly, beautiful signs. Bring the whole family! 2:45 pm: Procession along Northwest Highway with Life-affirming signs to the plaza at Hicks & NW Hwy (1/2 mile) to share the love of LIFE! 3:15 pm: Rally at the plaza with more prayer, songs, and words of hope. Immediately following the March: Join us back at St. Theresa for FREE refreshments courtesy of the Holy Ghost Council Knights of Columbus Ladies Auxiliary. Last year over 1000 people united for LIFE! With warmer weather, who knows how big it will get. Let’s find out! Please forward this to all your friends. Print out the attached flier to share. Can you get something in your bulletin? Wear yellow to the March! This is the Fraternal Calendar for the 2017 - 2018 year. Council #13448 was formed in January 2004, and is now composed of 97 members. We are an active group of motivated Knights from all ages and walks of life. Meet men that share our values and the belief you can be a man of the world and still have Christ at the center of your life'. We regularly welcome new members that are practicing Catholic men to join our ranks. If you even thought of joining the Knights come to our fourth Thursday social meeting (August through June) where the council members gather for socializing. You don't need a sponsor, you don't need to know anyone, prospective members just come join us. To find out more information about the Knights of Columbus at St. Mary Parish and the next social please contact Mike McEvoy Grand Knight or David Kukral, Membership Chairman. For members of other Councils or if transferring in, our business meeting is held in the school lunchroom on the 2nd Thursday, monthly at 7:30 PM. The Knights were founded in 1882 by Father Michael J. McGivney to serve the widows and their children in the parish. Now 1.8 million members worldwide with 15,000 local councils. Knights are dedicated to the principles of Charity, Unity, Fraternity, and Patriotism and participate in numerous charitable activities each year. K of C activities benefit their parish and all faiths of the community, brother Knights strive to deepen their faith as Catholic men, and throughout the world serve those most in need, as Jesus did! † May he rest in peace! Since its inception, there has been a link to the St. Mary Parish website from this website. There is now a link back to this website from the St. Mary Parish website under Organizations > Knights of Columbus. We thank Fr. Dan Whiteside and St. Mary Parish webmaster Mike Tuntland for adding this link. A new and convenient way to keep track of your volunteer hours is here! Each year, our Financial Secretary asks each of us to give him the total number of volunteer hours worked. If you are involved at Church as a Eucharistic Minister, Lector, etc., those hours count! If you volunteer your time with the St. Vincent DePaul Society, those hours count as well. If you visit the homebound on first Saturdays, count those hours as well. On your smartphone or on your computer, please go to www.kofcmobile.org and click the "Record Volunteer Hours" button. 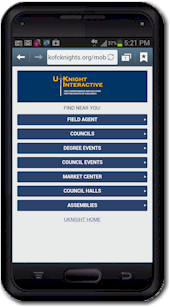 Those hours are all easily entered by members of Councils using the UKnight Interactive Network (the people who host our website) and then tracked, accumulated and totaled for our Council. We also are asking our members to set a monthly goal for themselves, and our website tracks their hours and reports their progress to them individually throughout the year. You can see the Goal Setting page in the Members Only section.